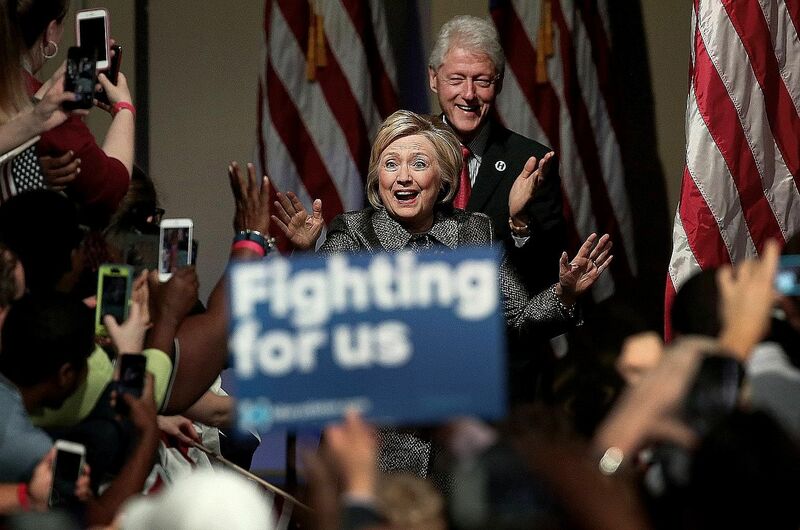 If Mrs Hillary Clinton wins in November, Mr Bill Clinton will occupy a doubly unique role in US political history - not just as the first First Husband, but also as the first First Spouse who used to be president. Obviously he won't spend his time baking cookies. So what will he do? Last week, Hillary stirred up a flurry of comments by suggesting that Bill would be "in charge of revitalising the economy". You can see why she might want to say that, since people still remember the good times that prevailed when he was in office. How his role might be defined in practice is much less clear. But never mind. What I want to do right now is talk about the lessons the Clinton I boom actually holds for a potential Clinton II administration. First of all, it really was a very impressive boom, and in a way it's odd that Democrats don't talk about it more. After all, Republicans constantly invoke the miracles of Saint Reagan to justify their faith in supply-side economics. Yet the Clinton-era expansion surpassed the Reagan economy in every dimension. Bill not only presided over more job creation and faster economic growth, but his time in office was also marked by something notably lacking in the Reagan era: a significant rise in the real wages of ordinary workers. But why was the Clinton economy so good? It wasn't because Bill had a magic touch, although he did do a good job of responding to crises. Mostly, he had the good luck to hold office when good things were happening for reasons unrelated to politics. Specifically, the 1990s were the decade in which American business finally figured out what to do with computers - the decade in which offices became networked, in which retailers like Walmart learnt to use information technology to manage inventories and coordinate with suppliers. This led to a surge in productivity, which had grown only sluggishly for the previous two decades. The technology take-off also helped fuel a surge in business investment, which in turn produced job creation at a pace that, by the late 1990s, brought America truly full employment. And full employment was the force behind the rising wages of the 1990s. Oh, and yes, there was a technology bubble at the end of the decade, but that was a fairly minor part of the overall story - and because there wasn't a big rise in private debt, the damage done when the tech bubble burst was much less than the wreckage left behind by the Bush-era housing bubble. But back to the boom: What was Bill's role? Actually, it was fairly limited, since he didn't cause the technology take-off. On the other hand, his policies obviously didn't get in the way of prosperity. And it's worth remembering that in 1993, when Bill raised taxes on the wealthy, Republicans uniformly predicted disaster. It will "kill the recovery and put us back in a recession", predicted Mr Newt Gingrich. It will put the economy "in the gutter", declared Mr John Kasich. None of that happened, which didn't stop the same people from making the same predictions when President Barack Obama raised taxes in 2013 - a move followed by the best job growth since the 1990s. One big lesson of the Clinton boom, then, is that the conclusion conservatives want you to draw from their incessant Reaganolatry - that lavishing tax cuts on the rich is the key to prosperity, and that any rise in top tax rates will bring retribution from the invisible hand - is utterly false. Hillary is proposing roughly a trillion dollars in additional taxes on the top 1 per cent, to pay for new programmes. If she takes office and tries to implement that policy, the usual suspects will issue the usual dire warnings, but there is absolutely no reason to believe that her agenda would hurt the economy. The other big lesson from the Clinton I boom is that while there are many ways policymakers can and should try to raise wages, the single most important thing they can do to help workers is aim for full employment. Unfortunately, we can't count on another spontaneous surge in technology-driven private investment to drive job creation. But some kinds of private investment might grow rapidly if we take long-overdue steps to address climate change. And in any case, not all productive investment is private. We desperately need to repair and upgrade our infrastructure; meanwhile, the federal government can borrow money incredibly cheaply. So there's an overwhelming case for a surge in public investment - and one side benefit of such a surge would be full employment, which would help produce another era of rising wages. So, will Bill play an important role if Hillary wins? I have no idea, and don't much care. But it will be important to remember what went right and why on Bill's watch.